Six Degrees of Separation, or, How a Mexican Star Became a Cajun Legend. Even if you have never wondered what ties Mexico to Henry Wadsworth Longfellow, I’m going to tell you anyway. It begins with a poem. 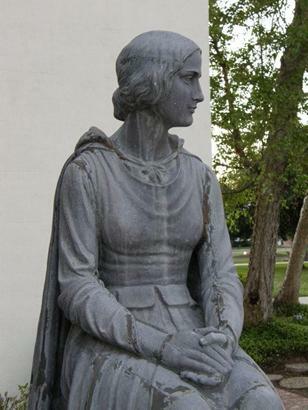 Longfellow’s epic 1847 poem, “Evangeline: A Tale of Acadie,” is the story of an Acadian girl, Evangeline Bellefontaine (“Fair was she to behold, that maiden of seventeen summers”), her betrothed, Gabriel Lajeunesse (“a valiant youth, and his face, like the face of the morning”), and their agonizing separation when, in 1755, the British deported Acadians (Cajuns) from Nova Scotia in The Great Expulsion. 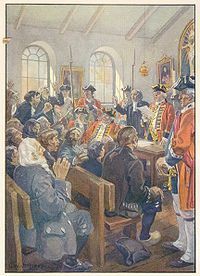 (”… all your lands, and dwellings, and cattle of all kinds forfeited be to the crown; and that you yourselves from this province be transported to other lands.”) Gabriel was torn from Evangeline’s side and crammed onto a ship bound for America, leaving her ashore, silently weeping. But not for long. In her quest to reunite with Gabriel, Evangeline follows his ship to America, and wanders on foot across mountains, rivers, and deserts, but she fails to find him. One day, strangers gave her hope: "Gabriel Lajeunesse . … 0, yes! we have seen him. He is a Voyageur in the lowlands of Louisiana." Evangeline travels through the bayous by boat, following a vision which “beckoned her on through the moonlight ..” On this, as on other occasions to come, she narrowly misses Gabriel by only one day. Was she pursuing but a phantom? Persistent Evangeline dedicates her life to the quest, even as she becomes a Sister of Mercy, nurses the poor and tends the dying. At last, her long search ends and she finds her lover, but she is too late. Gabriel has been taken mortally ill during an epidemic. “Vainly he strove to rise; and Evangeline, kneeling beside him, kissed his dying lips, and laid his head on her bosom.” Highly dramatic tale to be sure, (“Side by side, in their nameless graves, the lovers are sleeping”) and in 1929, Evangeline was exactly the right screen role for Mexico’s magnificent Dolores Del Rio. See? I got to the Mexican part. 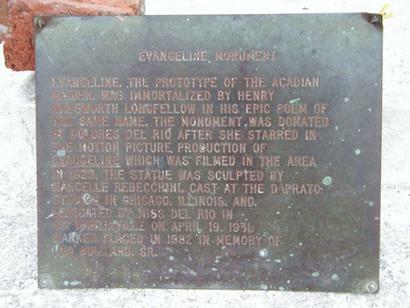 The film, Evangeline, was directed by Edwin Carewe, who had leapt aboard a train steaming out of his Gainesville, Texas, home town, bound for California. He was probably the first hobo to become a Hollywood film director. Besides del Rio, he discovered Gary Cooper, Wallace Beery, and other stars. But I digress and now return you to your regular programming. Del Rio was known to be much more than the most beautiful woman in the world. She was also a financial wizard, married to the man who designed the Oscar statuette (posed for by another Mexican star, Emilio “El Indio” Fernandez), and was regarded as very generous. Proof of this last admired characteristic can be found two hours west of New Orleans, just off I-10 headed for Houston. Here’s where the Cajun part comes in. 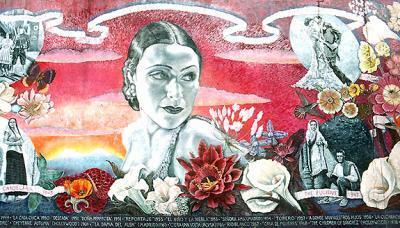 It was in St. Martinville, Louisiana, that Evangeline had come to rejoin her long-lost love, only to learn he had left the day before, and it is here, near the banks of Bayou Teche, an area pulsing with Cajun and Zydeco music, spicy dishes, and crawdads, that we see a gift from Dolores Del Rio: a magnificent statue of Evangeline standing just outside St. Martin de Tours chapel, the Acadians’ Mother Church. Today a major tourist attraction in St. Martinville, Evangeline’s statue was posed for by Dolores Del Rio herself, and donated to the town, giving new dimension to the very meaning of the name Evangeline: good news. What are the Six Degrees of Separation? 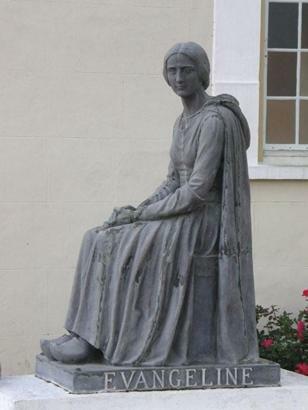 Longfellow poem to Evangeline to Gabriel to del Rio film to statue to Cajun legend.